Submitted by Taps Coogan on the 14th of May 2015 to The Sounding Line. When oil prices started to decline in 2014, US oil producers held firm for over a year and a half before unrelenting price declines forced them in late 2015 to dramatically reduce the number of drilling rigs being fielded. Despite the recent rally in oil prices back above $40 a barrel, punctuating nearly two years of declining prices, the US oil rig count continues to fall. Perhaps what is most remarkable about the 55% reduction in the oil rig count shown in the chart above, is that US oil production only decreased 6.5% from its high in 2015. 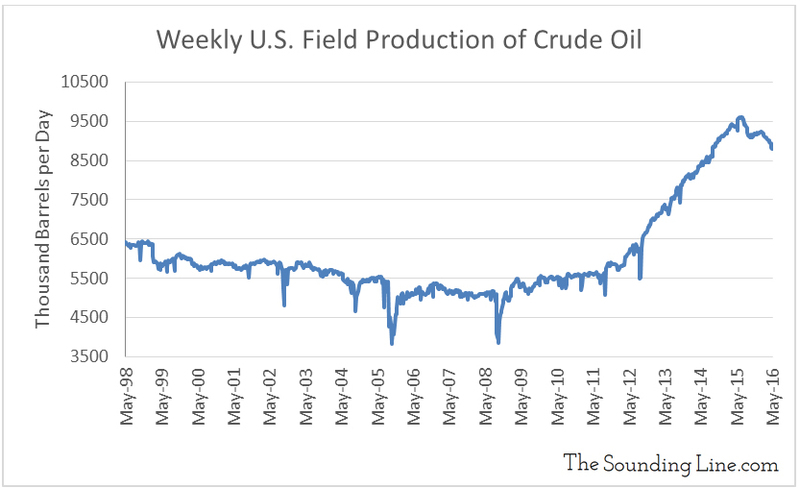 The decline in US oil production has been small compared to the decline in the rig count because producers have focused on exploiting only the most productive wells and have gone to great lengths to further increase the productivity of those better wells. They did this while mothballing the equipment and land that resulted in less efficient oil production. 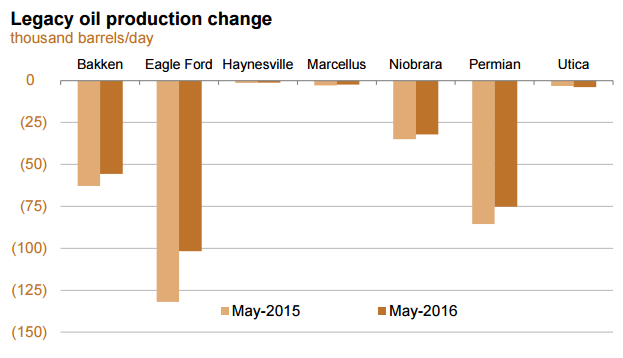 The charts below, courtesy of the EIA, show this in two different ways. 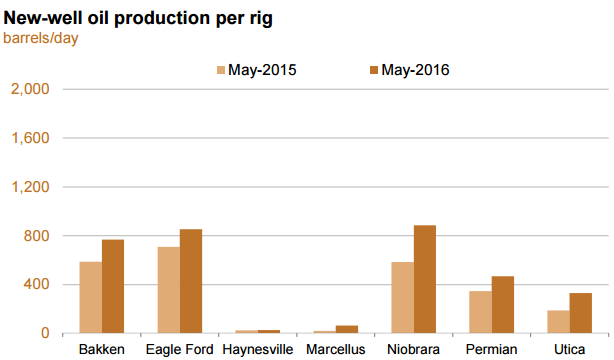 The first shows that for each of the major US oil fields, productivity in new wells increased significantly between 2015 and 2016. The second chart shows that the rate of decline in legacy wells has decreased. Despite these efforts, oil production will almost certainly fall further as the impact of off-line equipment continues to be felt and existing wells become ever less productive. Because it is the most productive wells that are being exploited now, and it will be more marginal prospects that would be brought online when prices recover, expect oil production increases to lag the rig count on the way back up, just as it did on the way down. Why is all of this so critical? From 2009 to 2014 the US energy industry was essentially the sole sector of the US economy producing bountiful high paying jobs. During that period it is estimated that the energy sector directly created over 400,000 jobs and added nearly 2 million indirect jobs in the US economy (link here). These very same jobs are now being shed and the impact of the oil industry mothballing rigs and equipment and the growing rate of oil bankruptcies among oil producers not only effects unemployment numbers, but does so with higher paying jobs. What’s more, the recent uptick in prices has been insufficient to halt the decline. 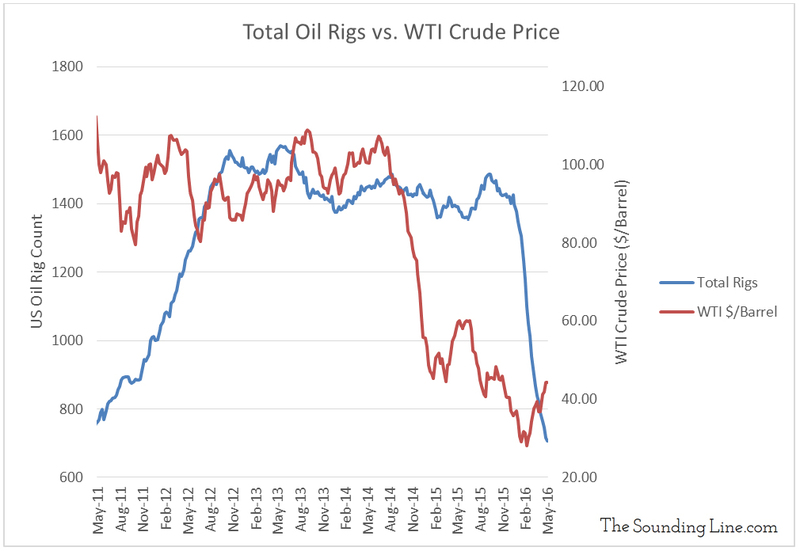 The energy sector actually kept a high number of rigs running in the face of falling prices far longer than many expected. The most severe reductions in their drilling activity began quite recently and is still ongoing even in the face of a modest price recovery. As such, the impact on the broader US economy is only taking form now. 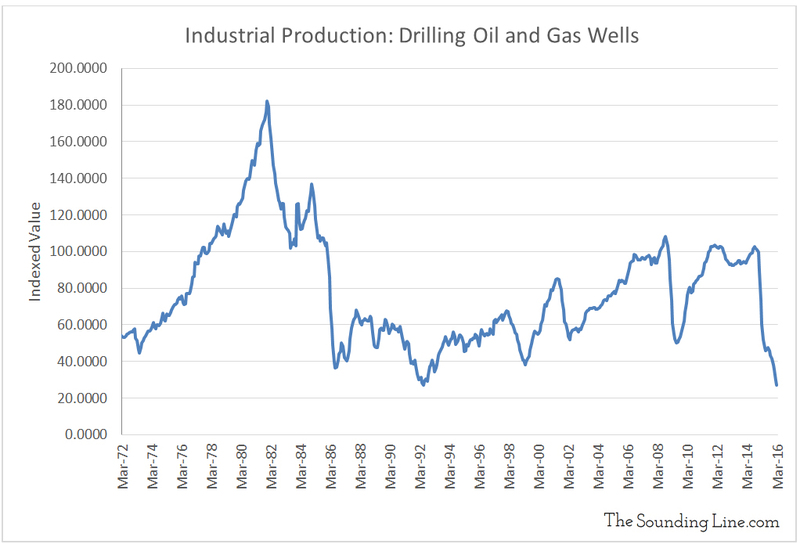 One way to asses the broader implications of this historic rout in energy prices to the US economy is to look at the industrial production associated with drilling oil and gas wells. As shown below, this metric has dropped to the lowest levels since records started in 1972. Combine this with the collapsing US coal industry as well as the impact that cheap fossil fuels have on all forms of alternative energies, and one can quickly see the long term impact that may come about. 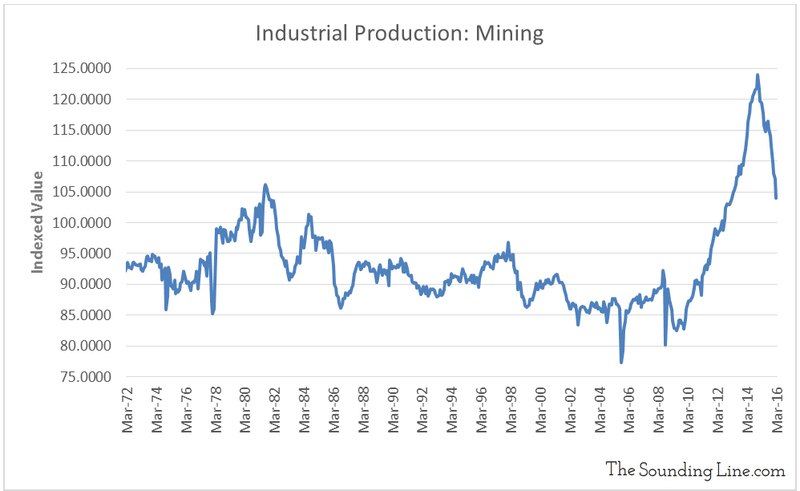 And then there are all of the other industries and basic commodities that make up industrial production associated with mining, all of which are experiencing their sharpest decline on record! The magnitude of the cut backs being made by America’s energy and mining sectors in response to low prices is truly historic and still unfolding. In the news links in the left hand column of The Sounding Line, we have been highlighting stories that describe the impact extremely low commodity prices are having on productive industries the world over. From Mongolia and Iraq to Canada, massive investments are being tabled, rubbing salt into the deep economic wounds created by lower revenues from mining and energy. The ripple effects that this will have on the broader economy are just starting to coalesce now.